Order your La Bella LTF-4A Low Tension Flexible Flats Bass Guitar Strings 42-100 from AMS and enjoy Fast & Free Shipping. Get the Best Deal with our Lowest Price Guarantee & Great Customer Service! 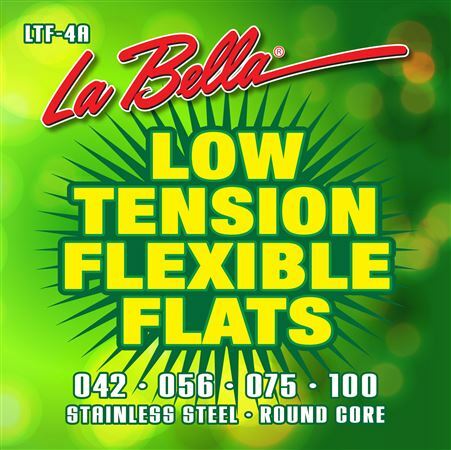 La Bella Strings is taking a new approach to flat wound bass strings; the result is the LIGHT TENSION FLEXIBLE FLATS series. Using the same techniques that have made the Deep Talkin’ Bass Stainless Steel Flat Wounds the best-selling flat wound set on the market, La Bella has adjusted the construction to create a lighter and more flexible alternative to our classic heavier flats. All standard bass sets are LONG scale length (37.25 inches distance from ball-end to silk i.e. “wound length”). Only the silk portion of the silk should wrap around the tuning post.